Steps from the sands of Mission Beach and Bay, and a stone's throw from Belmont Park, this remodeled 1940s beach cottage has it all! A 5 minute drive to Sea World, 15 minutes to the world famous San Diego Zoo, 20 minutes to the Mexico border, 35 minutes to Legoland or the Wild Animal Park, or an easy day trip, 2 hours, to Disneyland or Knotts Berry Farm. Enjoy all that the Southern California beach lifestyle has to offer. The home is west of Mission Blvd, approx. 10 houses from the sand. Ample parking (3 SUV's or 4 smaller cars), a storage area for bikes and boards, BBQ grill, patio with table and chairs, boogie boards, and beach chairs. Many of our tenants pre-book for the following year, so weeks are limited and go quickly! I am an attorney, and I live in San Diego. I bought the home to live in. Just steps to the beach, and Belmont park. Ample parking - accommodates 3 cars (can squeeze in 4 smaller cars). 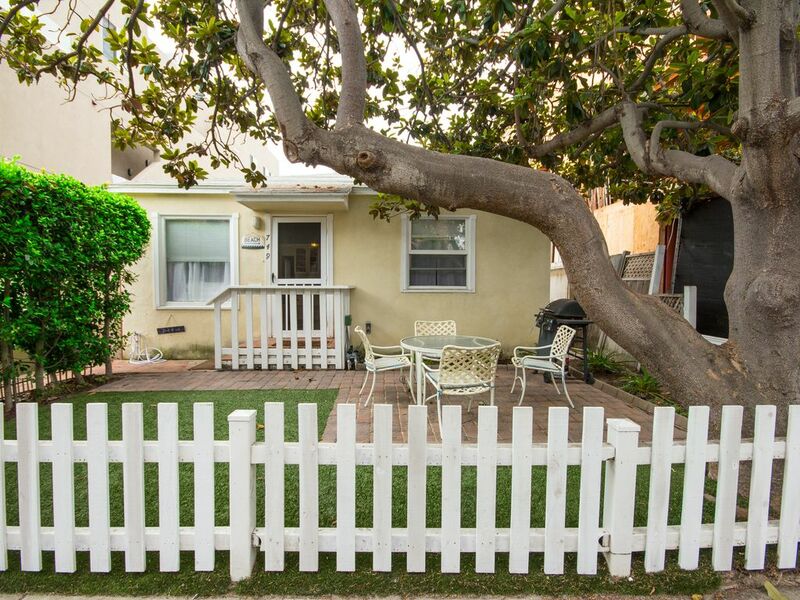 Cute cottage, west of Mission Blvd, steps from the sand and Belmont Park! Ample private parking (3 SUV's, or 4 smaller cars), and fully equipped for a week of fun at the beach. We have been going to this beach house for many summers. Even though we missed a few years since our last visit it was still the same. We love the house for it's location, parking, bedroom space and perfect kitchen for cooking and just hanging out. Because are so close to the beach we would make several trips a day and come back to shower and eat. It is the perfect place to hang out and relax, which is what our vacation is all about. Another bonus is being so centrally located to everything and being able to walk or ride our bikes (we bring our own) everywhere. I am also able to do my laundry daily if I need to! If your looking for some place with character and comfort you've found the right place! We have been visiting 749 Island for the last 7 years and can't imagine a summer with out it! It is clean, convenient and fun! The location is perfect! You are mere steps from the beach, Belmont Park, The Wavehouse, restaurants & tons of shopping.The owners think of everything and provide all we could want for our stay and more. We enjoy grilling, relaxing around the table in the front yard, walking up to the beach and walking around to all the great spots around us. With 3 assigned parking spots you can simply park your car & plan on not needing for the entirety of your visit. If you are looking for a place to stay with your family or friends and don't want to worry about anything this is the place for you. Swim, surf, or boogie board in the blue Pacific, ride the roller coaster at Belmont Park, or dine at the Wave House (as seen on MTV) and watch the brave try their luck on Bruticus Maximus, the massive standing wave!